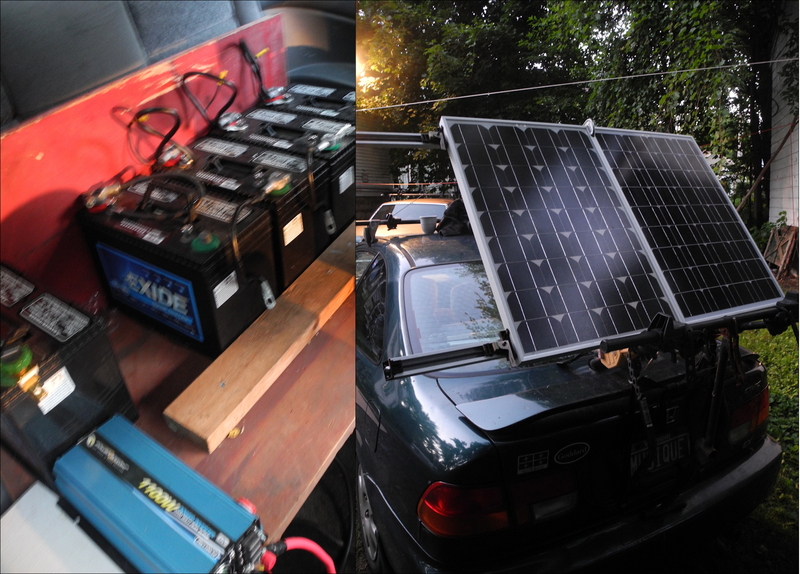 As a new commitment to The Rendezvous event, we’re tricking out a 1996 Honda Civic with 2 – 125W solar panels and loading the output into 6 Exide deep discharge marine batteries (500 Amp Hr. of storage)… allowing us (hopefully) to provide a Solar “Juice Bar” at the event. The “Juice Bar” will act as a mobile charging station for phones, recorders, pads and laptops. We should, with our capacity, be able to accommodate about 10 devices at once, and for most of the day. This is a prototype. Eventually we’d like to create a much higher capacity Ford Transit van using a combination of new flexible film and fixed panels, to work on-site at workshops and especially to help volunteer crews in the event of power-loss emergencies (weather-caused and otherwise). An additonal and important objective of this prototype is to see how well communal-sufficiency models evolve to embrace the sharing of scarce commodities… in this case, AC power. How like-minded people solve the prioritsation of their individually important “needs” when in a group of equally-needy folks is something we will have to work out in a smart, compassionate manner. How we solve this will vary from place to place. Alternative Energy, Community, Education & Activism meet in an under-the-tent outdoor farm setting at Irasburg, Vermont. Planning and work Sessions continue through the weekend along with Bread & Puppet presentations, non-violent Direct Action trainings and sustainable-living workshops such as energy alternatives, mushroom cultivation and wildcrofting, shared meals, and live music. This is an opportunity to directly engage with energetic people to make changes now, and further build the network of people to accomplish the new vision for a sustainable Vermont. At Kingdom County Farm – 1/4 mile north of Irasburg,VT on Route 14. Hosted by Mountain Occupiers, the featured keynote and workshop leaders are Amanda Lickers – an indigenous Seneca leader; and Peter Brown of McGill University, a spokesperson for Right Relationship.